Dimension: Height with Cylinder 500 mm +Width 1600 mm Length with Pallet Feeding Rack 4150. Hydraulic Paver Block Making Machine available in Semi Automatic and Fully Automatic Version. - Each Paver Machine can give production of 1800 to 2000 Nos. paver in 1 shift. Provided to the valued customers is superior quality Hydraulic Paver Block Machine. We provide them at reasonable rates at international standard. 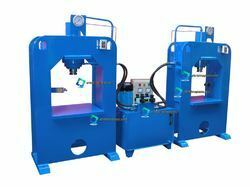 These machines have a fast and large production capacity. These Machines are very useful in the construction industry and are well appreciated for their optimum performance and easy operate ability. Casting Area : Mosaic Tiles upto 300 MM x 300 MM. Manufacturing Capacity : Paver 25 MM to 100 MM. Power Required : 5 H.P.